In this tutorial we’re going through an animation walk cycle step by step. If you don’t know the key poses or understand the locomotion behind a basic walking cycle – I recommend you check out our walk cycle animation blueprint tutorial first. 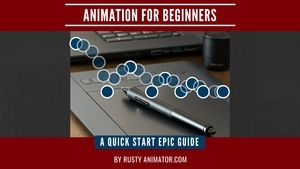 Walk cycles typically intimidate a lot of new and even experienced animators for good reason…. Well… we see people walk all the time. So even if we don’t have a lot of practice animating, we know when the slightest bit of a walk is off. I mean how fast do you notice someone who has a limp? Or someone’s walking happily? Or drunk? So it’s no surprise why we can quickly get frustrated or overwhelmed creating our first walk. This tutorial will eliminate all of the BIG challenges you’re up against and level up your animation skills at least 2x times as fast than if you were learning on your own. In the video above you can see I’ll be animating in Maya since it’s the industry standard for most movie and game jobs. As for the character rig I’m using the body mechanics rigs – mega pack by Joe Daniels. I’m not sponsored by him but I do find these rigs to be very robust compared to most options out there. Of course you can use whatever rig you like. For a bunch character rig options check our Best Free Maya Rigs post. And I’ll be animating with a layering approach. Meaning I’ll be working on 1 body part a time. This approach works great for very physical action, breaking down complicated moves into manageable chunks, and animations that have a pretty standard formula like a basic walk. As the hips and feet are the motor of the movement that’s where we’ll start. And finally we’ll do a polish pass on the legs for better rotations, toe overlap and to minimize any knee pops. The hips and feet are the foundation for the whole walk. Once we get the weight right there the upper body will be much easier to put together. On Frame 1 – Bring the cog down a bit to give slack in the legs. Let’s find our gait for the walk by bring the feet out. The front foot will have only the heel contacting. Then on frame 13 we’ll do the same pose but we’ll mirror it. We’ll be adjusting the feet and hips more as we go. Leave the forward foot where it’s at. For now it’s good enough. This gives us arcs from multiple sides. Right now the computer is in-betweening the heel raise and the rotation – as the foot lifts. Middle Mouse copy and key from frame 16 to 17. Now lets ZERO out the heel raise on frame 17. And in between this frame ourselves. So we’ll be matching closely the angle of the foot and the toes with the toe bend and foot rotation – giving us a much smoother natural foot pickup. Just like the upper body – the head will be delayed in x rotation compared to the hips. But since it’s attached to the body it will be delayed by at least 1 frame more. The same applies to the rotate z.
we will be toning more of this down later – but it’s good that we went extreme first. The arms in a normal walk are very secondary – very lazy. Their movement is really driven by what’s happening in the body. That’s why we are focusing on the arms toward the end of the animation walk cycle. Because if we changed anything in the spine it would affect the arms. Now can you guess where all the movement begins in the arm itself? All the movement comes from the upper arm and shoulder first – So that’s exactly how we’ll start and work our way down. If your arms are in IK – you’ll want to switch to FK to get that natural dependency between the joints that happens in real life. Go to our down pose on frame 4. Rotate the shoulder down first in one axis. Then rotate it forward in another axis. All we are going to key first is the swing forward and back in one axis. and key this arm swing back. We are setting these keys on the down pose as it’s the widest point for the arms in a walk. On the contact pose and the passing pose our arm swing will be easing in to this down position . Depending on the RIG you may find that rotating the arms becomes a challenge. After you set a couple of keyframes on all the different rotation axis’s – you might see the arms flip around a crazy amount. This is called Gimbal Lock which is a whole other tutorial – but just know that the fast way to avoid all of that is to switch the rotation order. Put the main axis you want to use – first in the rotation order. In this case we primarily want a swing forward and back in the arm. Thats Z on this rig. Like a pendulum the arm reaches its lowest point in the swing at the middle of the swing. So let’s drop the shoulder on the passing positions for a deeper arc. The hand is dragging even further behind than the elbow and forearm. So we’ll key the extreme for the hand 2 frames after that on frame 8 and 20. That’s a 4 frame differences from the top part of our arm. Our arm overall is looking good from the side view. But from the front its wall smacking because we haven’t even considered it yet. We need arcs in all angles to provide the most fluid movement possible. This is true even if we end up just looking at the side view. A common way to achieve this is to animate with a figure 8 path of action. An arc tracker on the hand is helpful to show us how the figure 8 looks in 3d space. It’s how the arm twists as it swings. We’re going to add just a bit of twist in the upper arm here so that it overlaps nicely with the hand. At this point we’re in the polish phase. It’s time to clean up last few bits to make it all as smooth and fluid as possible. Adding little bits like toe overlap for extra flexibility. We can also take this time to experiment with slight offset changes, or adjustments to the feet arcs – and hand arcs. So let’s do some of that now and we’ll wrap this walking cycle up. First we should get these legs cleaned up. The foot arc could use some work – so let’s tweak that a bit – from the side view and the front view. Its what usually drives animators CRAZY! It’s super common obstacle for anyone that’s animated a walk in 3D before. Because to fix it you usually have to fight the character RIG. You have to use a combination of all of your foot attributes – including stretch and maybe even the hip to keep the knee always progressing. As if there’s a hitch in spacing it will give us a POP. And people usually do this early on in the animation process rather than at the end. If we had worried about this when we were still figuring out our hip movements this would have been a back and forth nightmare. But now it’s not so bad. We could keep tweaking the knees, adding finger overlap, trying different extremes for the body – it could go on endlessly in search of perfection. BUT at some point like if you were working as an animator with a deadline – you’ve got it call it done and move on. Your Animation Walk Cycle is complete! FAR from the best walking cycle ever but a great exercise to develop your animation skill. If your cycle looks almost as fluid as in the video above – GREAT JOB! Scroll down for a free Run Cycle Tutorial. If your not ready – give this walk another try… or move on to a different animation and circle back to this. Refer to our Walk Cycle Tutorials page for all the tutorials, tips, and resources we have on walks. Let it be your guide until your ready to level up. Trust me nobody ever becomes a pro because their first animations were amazing. It always takes consistent practice. Until next time – Happy Animating! how to animate a run cycle step by step. Previous Post Walk Cycle Animation Blueprint: A how to tutorial Next Post My return to animation studios? What plugin are you using to get the toolbar (above the timeline) with the tween controls and arc tracker etc? Which is being replaced soon by Animbot. An essential tool kit for most animators today.